For centuries, Rajasthan has witnessed several marauders and people from different regions of the world and that is the reason why the region has absorbed some of the traditions, culture, and style of these visitors. 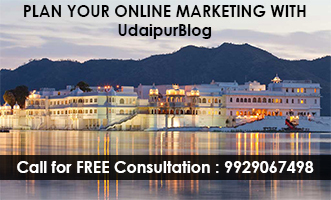 The land of Rajasthan is ancient which has witnessed perhaps one of the earliest human civilizations. These civilizations include Kalibangan dating as far back as the fourth millennium. Every community and tribe here has its own typical costume with different significance dating back to the time when they were adopted or evolved. 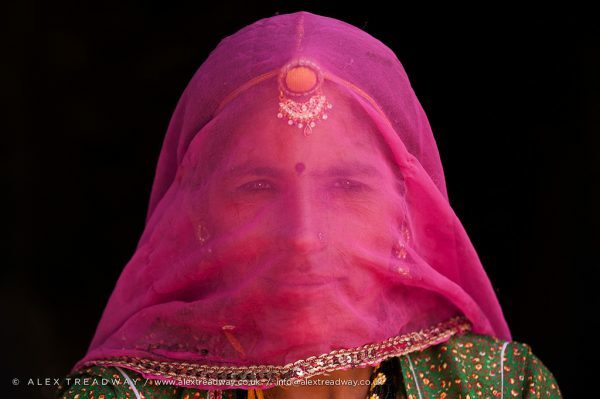 The women of Rajasthan are much like the region itself. They are all swathed in colors and traditions. From centuries the women costume has involved a lower garment (Ghaghra or the skirt), an upper garment (Kurti, Kanchli, and Puthia) and a veil (Odhni or Ghoonghat) that flow across the upper as well as a lower garment on the body. Although there are variations and additions in these according to different communities the basic structure remains the same even today. Ghaghra is a form of long skirt which is embroidered and pleated. It covers the legs partially or fully depending upon the ethnic groups they belong. The Ghaghra is secured at the waist or hips and is made out of two to three layers of coarse Khadi fabric which created the flared look. Ghagras decorated with gota and badla embroidery were also worn on special occasions. In the present time, the ghagra or lehenga makes a perfect bridal ensemble. Contemporary Indian designers such as Anita Dongre and ‘Abraham and Thakore’ have showcased Rajasthani influences in their designs. Yet the influence hasn’t restrained itself just to Indian designers. A ghoonghat is known by a number of names such as ghunghta, ghumta, odhni, laaj, chunari, jhund, odhna, etc. It is a veil or headscarf which is used by the women to cover their head and often their face. Generally, aanchal or pallu which is the loose end of the ghoonghat is pulled over the face or the head. The ghoonghat was showcased by Elie Saab at Paris Fashion Week in the year 2016. The utility of Kanchli is almost the same as that of Puthia. It is also called as Angia or choli. Kanchli is mostly worn by married women in many communities in Rajasthan. Kanchli is worn in conjunction with Kurti. Kurti is usually a garment with sleeves or without it and a deep, horseshoe neckline. Designer Valentino showcased contemporary women’s clothing which was inspired kurtis worn by women in Rajasthan. Puthia is a double-breasted upper garment which is quite similar to angarkha and its shorter version, angarkhi. The antiquity of the garment can be determined by the fact that the term Angarkha is derived by the Sanskrit words Anga means body and Raksha means protection. Many sculptures, paintings, and early Sanskrit literature represent the clothing element artfully tied around the chest. Puthia portrays non-fertile phase of women. The costume is not worn after a girl reaches puberty. 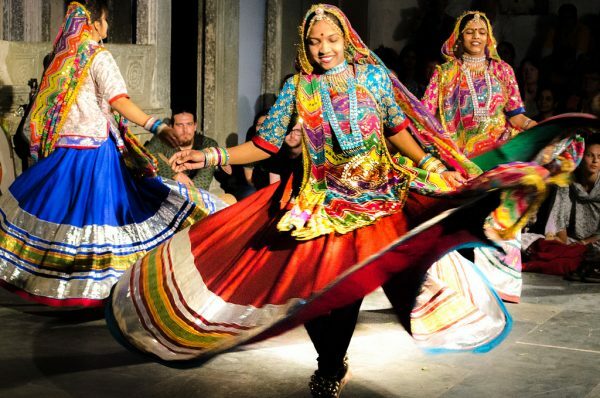 Jootis are the traditional Rajasthani footwear which can be worn by either men or women. These can be paired with Kurti/kurta for a casual look or with Ghaghra or bandhgalas. The outfit of men in Rajasthan has been exposed with outsiders who have visited the region in successive migratory waves. And for the same reason, the men’s clothing is an assimilation of historical and foreign influences. A kurta is an upper garment originally worn by men, though now it is majorly worn by a woman which is known as Kurti. A Kurta is a collarless shirt falling just above somewhere below the knees of the wearer. The word Kurta has been derived from Sanskrit Kuratu/Kurtaka. Bandhgalas are perfect for weddings and can be paired with Dhotis and kurtas. Bandhgalas along with turbans and Jodhpuris were showcased by Jean Paul Gaultier which displayed the royal tradition of Rajasthan during a fashion week in Paris. Dhoti is renowned with different names such as panche, vesti, dhuti, mardani, chaadra, dhotar or panchey is a traditional garment for men. It is an unstitched piece of cloth wrapped around the waist and the legs and is knotted at the waist. Dhoti has been evolved from the ancient antriya which passed through the legs, tucked at the back covering the legs loosely. Angarkha is also worn by men, though the style differs a bit. Angarkha is overlapped and tied to the left or right shoulder. The Angrkha used to be a court outfit that a person could wrap around himself. It also offered flexibility with the knots and ties. 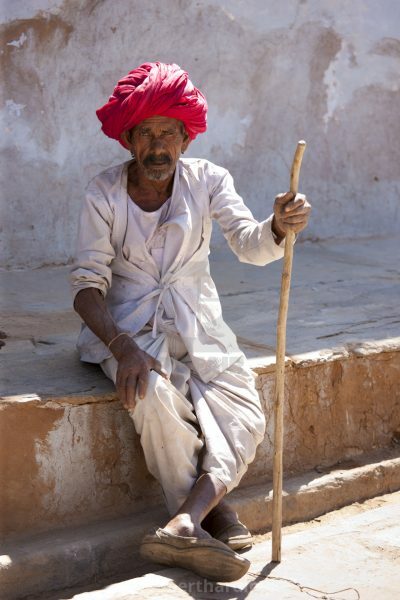 Turbans which are worn in Rajasthan are known as Rajasthani Pagri. These Pagris are used to indicate the social class, caste, and region of the wearer. Sometimes they differ on the basis of occasion also. 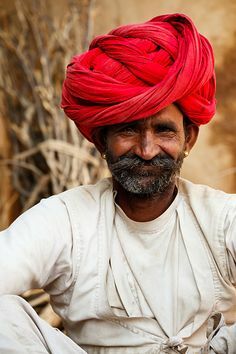 People from hot desert area wear large and loose turbans whereas farmer and shepherds wear one of the biggest turbans which can protect them from harmful natural elements. 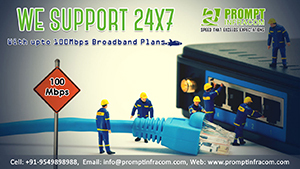 It is possible that it was originated because it has various functions as well. Rajasthani travelers used it as a pillow, a blanket or a towel; it was also used to strain muddy water or to draw water from a well after tying it to the bucket. Traditional Rajasthani Jewelry plays a very important role in Rajasthani fashion. Pieces of jewelry such as Nath (nose ring), payal, Mang tikas, etc. are very famous of them all. 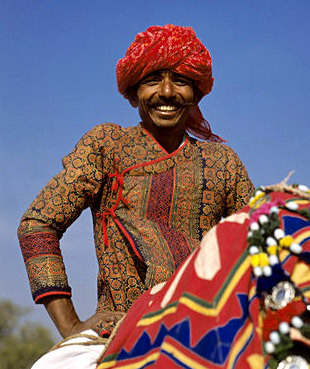 In the year 2011, a collection of traditional Rajasthani fashion was represented by Karl Lagerfeld which included mang tikas, kurtas and payals. Next article5 Reasons why Enigma Restaurant and Lounge is the Best Hangout Place in Udaipur Right Now!